As special educators, we often get the curriculum short end of the stick. It's not unusual to find a special education classroom stocked with little curriculum or leftovers that another teacher left and no budget to purchase anything new. I have a lot of direct instruction programs that were designed for at risk students but that I don't really find work for my students with severe disabilities. I also work in a district where that has a lot of subscriptions to curricula and programs and I often incorporate them into my classroom. I love using Reading A to Z and Writing A to Z with my students in reading groups and I usually use Go Math for at least one of my math groups. I'm also seeing schools move more towards full inclusion and push in models, so it's important that special education teachers understand how to modify curriculum to make it work for our students. Over the years, and with lots of trial and error, I've figured out a way to use lessons that weren't exactly designed for the population I teach and seen tons of student success! 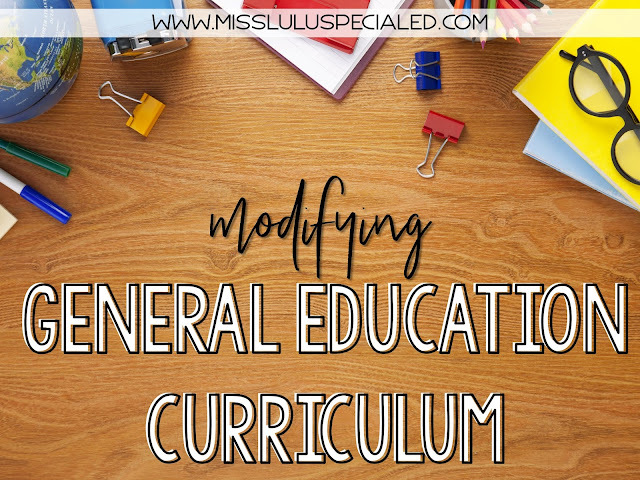 Here's are some tips when modifying general education curriculum. 1. Determine the big idea. What is the point of the lesson? What do you want the students to take away from this lesson? A lot of times this is spelled out very clearly. It's also possible that we may want to narrow down the objective for our special education students, or break one objective into several lessons worth of objectives. 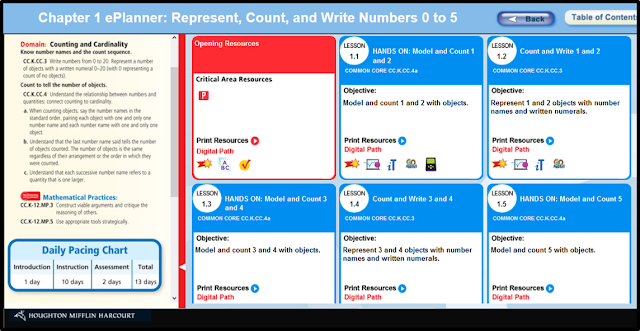 Here's a few examples from Go Math. I usually group these 2 objectives together and combine the lessons during our beginning of the year review. 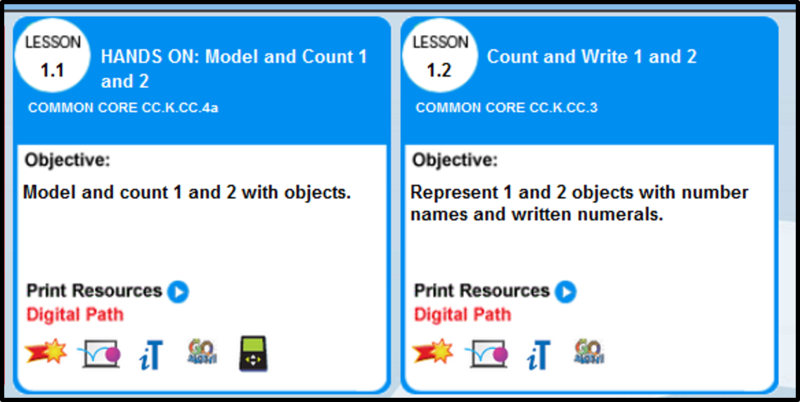 Most of my students have a really hard time grasping decomposition of numbers, so I usually break this objective into even smaller increments so they really get a lot of practice with decomposing. 2. Plug the lesson format into the effective teaching cycle. You know- I do, We do, You do. Even if the program you are using does not lay it out that way, it's easy to fit it into the format that we know works. 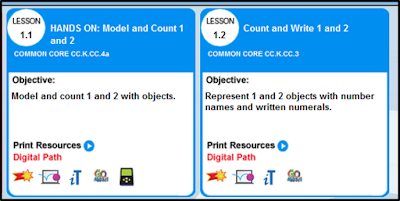 When I teach Go Math, I review vocabulary as our introduction, then introduce the new skill by modeling, move into Guided Practice and students do the textbook worksheets with me, and then when they have demonstrated that they know what to do, I have them work on the Standards Practice workbook on their own. I use this simple outline to jot down how I am going to teach each lesson. 3. Provide additional practice. Most general education programs won't provide enough guided or independent practice for our students to really master the skill. Supplement the program and use other materials to provide additional practice opportunities. Just make sure they are actually practicing the same skill that you just taught and modeled. You can use the intervention or enrich parts of the program that you are teaching from to provide extra practice. I love using TpT resources to supplement! 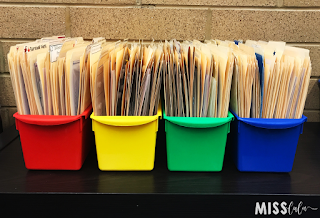 This is where I pull out file folders, task cards, games and iPad apps to provide a variety of practice. I also have the students work on the skill during math centers. 4. Assess. Look at the end of the unit/chapter assessment and determine how you can use it or find an alternative to assess the skills. It's ok to do a hands-on or verbal assessment if a written assessment is not a good option for your students. But it is important that you are assessing the objective that you determined in step 1. I will sometimes pick and choose questions and present them one at a time instead of giving the student the whole worksheet. Sometimes, I just take data on the independent practice that we do and don't actually use a real "assessment." As long as your data shows that the student understands and can perform the skill, you've assessed. 5. Move at a slower pace. I basically throw timelines out the window when using a general education curriculum. It's ok to spend more than 1 day on the lesson. Maybe you need more time to model and more guided practice before moving into independent practice. 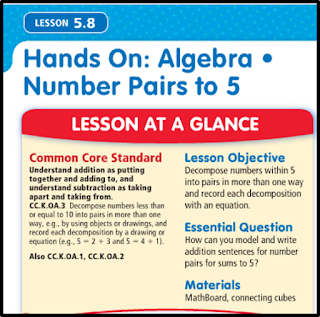 Here's a few more Go Math examples. The pacing chart from this chapter shows a total of 13 days to complete. But most of my groups can get through this chapter in 5-7 days. 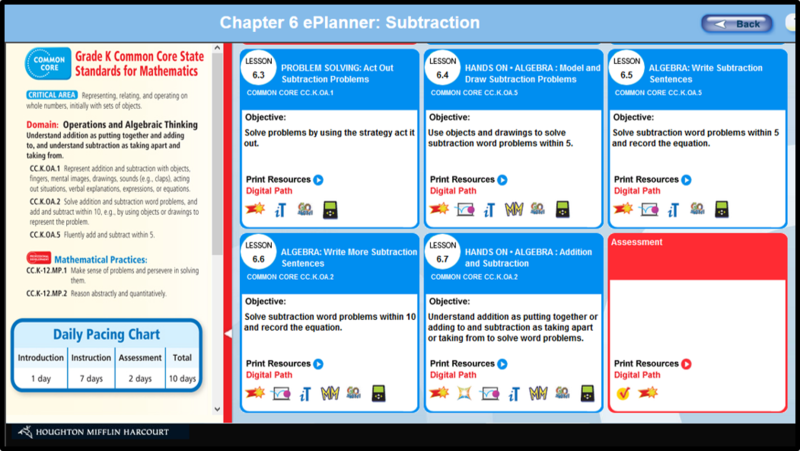 The pacing chart for this chapter on subtraction shows a 1 day introduction and 7 days of instruction. I know that my most of my students will need more time on this skill so we usually spend closer to 2 weeks on this unit and constantly review it throughout the year in our independent work stations. 6. Teach at the student's instructional level, not grade level. This kind of goes without saying but I wanted to clarify. 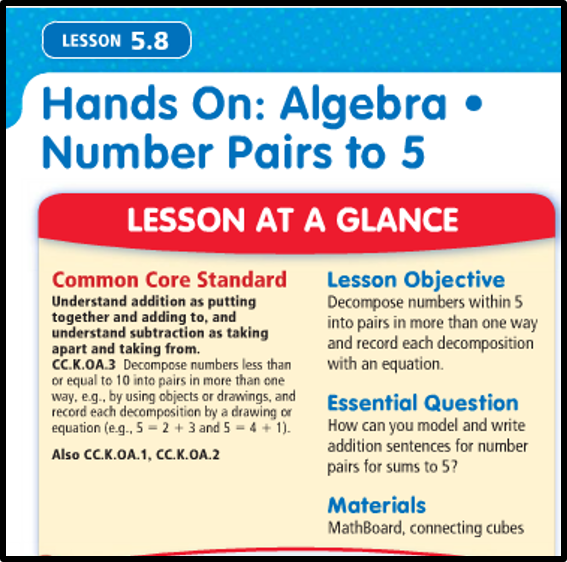 I teach middle school and I use Kindergarten-3rd grade Go Math programs because that's the instructional level that my students are at. So I may skip some of the activities that are totally not age appropriate (like the Curious George videos) and replace them with something that is more age appropriate, usually something I found on TpT. Overall, the lessons are fine for my middle school students. Reading A to Z levels are grade equivalent from Pre-K up to about 6th grade, but my middle school students are usually reading anywhere from a Level AA to a Level Q. I choose books that have real pictures whenever possible, topics that my students can relate to, and I always make sure my students also have access to other books in the classroom or through the library. That being said, don't forget this. When we are teaching at instructional level, it's important to make sure that the student is still receiving instruction based on their current grade level standards. When I make my curriculum map at the beginning of the year, I align my Go Math K lessons to my 7th-8th grade essential elements. 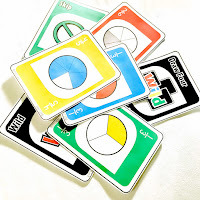 For example, I''ll teach the Kindergarten chapter on 2D and 3D shapes, and throw in extra practice on rotation, reflection and translation, which are my middle school geometry standards. That way I am making sure that the student has the basic fundamental understanding at their level and I'm extending their knowledge to higher level concepts through adapted standards. I also provide additional instruction on grade level standards through standards based centers because it's not always possible to align K level concepts to middle school standards. Whew, that was a lengthy post but I hope it was helpful! I'll have more posts coming this summer about how I incorporate student IEP goals into these programs and how I collect data. Feel free to leave any questions below! These instructors fundamentally make education CENTRAL KENYA more accessible and available to understudies who generally would have restricted access to education because of whatever handicap they are battling with. Training is something that many have said much regarding. A large portion of these are mind boggling or obscure. Consider the Greek savant Aristotle's expression that instruction is 'a trimming in flourishing' and 'an asylum in misfortune'. Thanks for a very interesting blog. What else may I get that kind of info written in mayo school delhisuch a perfect approach? I’ve a undertaking that I am simply now operating on, and I have been at the look out for such info.Thanks for a very interesting blog. What else may I get that kind of info written in mayo school delhisuch a perfect approach? I’ve a undertaking that I am simply now operating on, and I have been at the look out for such info.